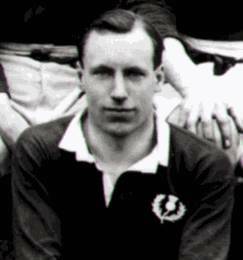 Eric Liddell was also a gifted rugby player and played for the Edinburgh Univerisity 1st XV team. He also played international rugby for Scotland and gained seven international caps as a wing-threequarter, scoring four tries thanks to his searing pace. These are the summaries of the seven matches he played in. A. Jaureguy scored but Crabos failed: (3-0); A. Browning scored but Maxwell failed (3-3). (H.T.). The ground was soft after some heavy rain but the dismal conditions did not keep away a record crowd of 37,000. The game was fairly even up to half time; then rain fell continually so that handling became very difficult. The Scottish pack dominated the second half but no score came from many near things, the French defence being desperate but successful. 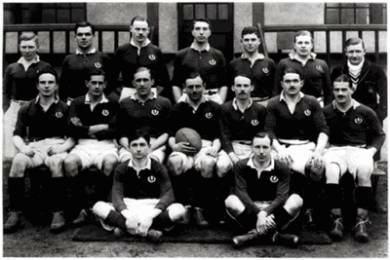 Wales: F. Samuel (Mountain Ash), F. Palmer (Swansea), I. Evans, (Swansea), B. E. Evans (Llanelli) C. Richards (Pontypool), W. Bowen (Swansea), W. J. Delahay (Bridgend), T. Parker (Swansea), J. Whitfield (Newport), S. Morris (Cross Keys), D. D. Hiddlestone (Neath), T. Roberts (Risca), J. G. Stephens (Llanelli), W. Cummings (Treorchy), T. Jones (Newport). There was no scoring at half time. W. Bowen scored and Samuel converted (0-5); A. Browning scored but Bertram failed (3-5); A. Browning kicked a penalty and scored a try which he did not convert (9-5); I. Evans dropped a goal (9-9). The Scottish forwards played well but their backs did not make good use of a plentiful supply of the ball, Bryce had a fine game making several good breaks, one of which gave Browning his first try. The winger also had a good game, scoring all the points. The opening score came when Forsayth, catching a high kick under the posts, had has kick charged down by Bowen who ran on to drop on the rebound. Evans’ equaliser came in the last minute and a very disappointed crowd left in stunned silence. Ireland: W. E. Crawford (Lansdowne), H. W. V. Stephenson (Un. Services), G. V. Stephenson (OU Belfast), D. B. Sullivan (U. C. Dublin), T. G. Wallis (Wanderers), J. R. Wheeler (OU Belfast), J. B. Clarke (Bective Rangers), W.P. Collopy (Bective Rangers), M. J. Bradley (Dolphin) I. Popham (Cork Const. ), F.G.T, Hallaran (Un. Services), S. McVicker (OU Belfast), R. H. Owens (Dublin University), J.K.S. Thomson (Dublin University), J. D. Egan (Bective Rangers). J. A. Clarke scored but Wallis failed (0-3). (H.T.) Bryce and E.H. Liddell scored but Browning failed to convert (6-3). A Strong wind made handling difficult and play often surged from end to end. The Scottish pack held in the first half, finished strongly to give Bryce, who had another good game, and the backs the chances they needed, for the Irish defence was fast and effective. G.P.S. Macpherson did not please the critics as a stand-off half. 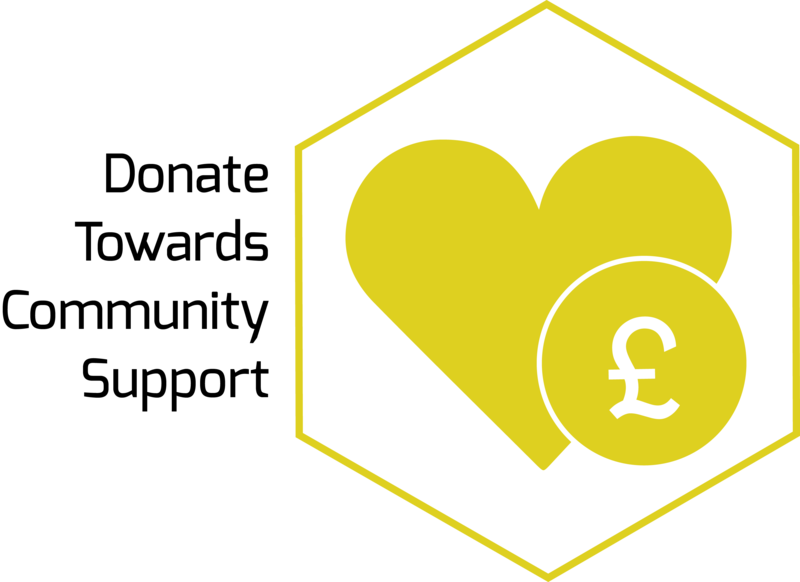 Wales: B.O. Male (Cardiff), W. R. Harding (Cambridge University), A. Jenkins (Llanelli), R.A, Cornish (Cardiff), T. Johnson (Cardiff), J.M.C. Lewis (Cambridge University), W.J. Delahay (Cardiff), A. Baker (Neath), S. Morris (Cross Keys), D.G. Davies (Cardiff), T. Parker (Swansea), G. Michael (Swansea), G. Thomas (Llanelli), L. Jenkins (Abaravon), T. Roberts (Newport). A. Jenkins kicked a penalty, (3-0). (H.T.). E .H. Liddell scored but Browning failed (3-3), J.M.C. Lewis scored and Jenkins converted (8-3): L. M. Stuart scored but Browning failed (8-6): A.L. Gracie scored and D. Drysdale converted (8-11). Although the police closed the gates before the start, a record crowd got in and lined the playing area. They were to witness a hard game which finished with one of the most famous tries in the history of the game. Wales failed to take their chances in the first half and only led by a penalty goal. Straightway Eric Liddell showed his pace by scoring a fine try only for Wales to increase their lead to 8-3 with a converted try. Then with fifteen minutes to go the Scottish pack put in a tremendous finish. Firstly, L. M. Stuart scored another fine forward rush. Then came two scoring attacks by the backs but Liddell and Gracie were both tackled short of the line. With three minutes to go the ball was heeled from the scrum on the 25; Bryce passed to McQueen who went to the left and seeing that McLaren was covered, threw a long pass over his head to Gracie. Now in his own words: ‘Running, slightly diagonally to the left to go between Arthur Cornish and “Codger” Johnson, who I saw in a flash was in two minds – whether to go for me or run between me and Liddell and prevent me passing to the latter … as I went on the way opened up for me and the tactics to be adopted were as plain as a pikestaff. Whether I dummied or not I do not remember but I was just able to swerve round my opposite number and in doing so saw I had Male on the wrong foot and all I had to do was to carry on over the line. But here I nearly spoilt everything, the dead ball line at Cardiff was desperately close to the goal line and in trying to touch down near the posts I recklessly ran along the dead ball line, only inches off it, till the close proximity of Cornish and Jenkins made me decide to drop on the ball”. It is recorded that he was so close to the dead ball line that a small boy sitting there was struck by Gracie’s boot and lost some teeth. One can only add that the disappointed Welsh supporters swarmed onto the field and carried Gracie off the field shoulder high! Ireland: W. E. Crawford (Lansdowne), D. J. Cussen (Dublin University), G. V. Stephenson (Queen’s), J. B. Gardiner (NICF), R. O. McClenahen (Instonians), W. H. Hall (Instonians), W. Cunningham (Lansdowne), M. J. Bradley (Dolphin) R. Collopy (Bective Rangers), W.P. Collopy (Bective Rangers) D. M. Cunningham (NICF), P.E.F. Dunn (Bective Rangers), R. D. Gray (Old Wesley), T. A. McClelland (Queen’s), J.K.S. Thompson (Dublin University). J. M. Bannerman (Glasgow HSFP), J. R. Lawrie (Melrose), D. S. Davies (Hawick), R. S. Simpson (Glasgow Academicals). D. J. Cussen scored (3-0): E.H. Liddell scored and Browning converted (3-5). A Browning scored but failed to convert (3-8). (H.T.) S.B. McQueen scored and Browning converted (3-13). In drizzling rain Ireland played a spoiling game and gave Gracie and Mclaren little scope. Nevertheless, the two wingers were successes, Liddell showing that he was not only very fast but determined. It was considered that McQueen, given a good supply of the ball from the scrums, did not vary his play enough. Drysdale was praised for his defence. A. M. Smallwood scored but W. G. E Luddington failed (0-3): E. McLaren scored but A. Browning failed (3-3). (H.T.) A. L. Gracie scored but D. Drysdale failed (6-3): A. T. Joyce scored and W. G. E. Luddington converted (6-8). The match was played in brilliant weather before a crowd of 30,000 which included the Duke of York. The teams were quite evenly matched but England were expert at seizing chances, their pack being very ready to run with the ball. Smallwood had a good solo try after beating the defenders and this was later matched when Gracie, taking the ball on at his feet, kicked it past the full back and only his speed enabled him to fall on the ball just before it went over the dead ball line. The winning score came from an interception by Locke (? Or Lowe?) which was carried on by the forwards for Joyce to score. A. T. Joyce scored and W. G. E. Luddington converted (6-8).